George Rodrigue was an amazing local artist best known for his Blue Dog paintings. He was born in New Iberia, Louisiana after moving away for a little bit for college, he returned to Louisiana in the 1960’s. Rodrigue passed away on December 14th 2013 and his talents will be missed but he lives on through his artwork. In the 1990’s Rodrigue began painting artworks featuring a Blue Dog. The Blue Dog is based on a Cajun werewolf/dog legend called ‘loup-garou’ and his paintings transformed the legend into a pop icon. Over the years, Rodrigue painted many things with the Blue Dog embedded into the artwork. While the first Blue Dog painting was based off of an evil spirit, over the years, the features in the dog changed and he went from a scary mythical creature, to a blue dog with a more kind face that no longer . Each painting tells a story and has unique background information. The painting pictured Right Place, Wrong Time is a good example. According to Rodrigue’s wife this imagine marked a change in the Blue Dog series. 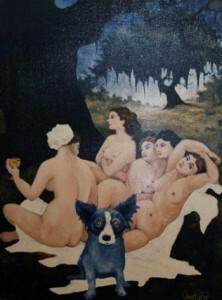 Rodrigue began painting Tiffany with people rather than alone. His nudes were very controversial this work was no exception. If you are interested in purchasing one of George Rodrigue’s famous Blue Dog paintings, contact Barnett Fine Art at 504-524-2922. This entry was posted on Wednesday, December 18th, 2013	at 5:16 pm	and is filed under Art For Your Collection	. Both comments and pings are currently closed.